I have long believed that a powerful way to reach people about the sentience of animals and our shameful treatment of them is through fiction. Thus, I keep my eyes open for good novels with the courage to tackle that difficult topic. The most recent read is a remarkable literary thriller called The Wildlands, by Abby Geni. A couple of years ago, I had read Geni’s earlier book, The Lightkeepers, an atmospheric, slow-building suspense novel about a nature photographer who travels to the Farallon Islands on a long residency. The tension between man and animals is woven into the story beautifully, but I found this most recent book a step up in her willingness to blend compelling narrative with a sense of social justice for animals. The Wildlands opens with a Category 5 tornado that ravages the town of Mercy, Oklahoma, with particular vengeance aimed at the McCloud family. Four siblings, who have already suffered the loss of their mother from cancer, huddle in the basement while the storm demolishes their home, their father, and their farm animals. Sisters Darlene, Jane, and Cora weather their survival by making media headlines, while their brother Tucker abandons them and disappears. 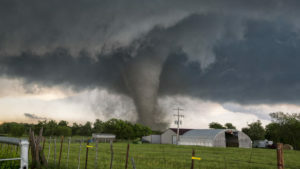 ​ On the three-year anniversary of the tornado, a cosmetics factory outside of Mercy is bombed, and the lab animals trapped within are released. Tucker reappears, injured from the blast, and seeks the help of nine-year-old Cora. Captivated by her charismatic brother, she agrees to accompany Tucker on a cross-country mission to “free” the animals, even if it means using violent means. I was very curious to see how the author would portray this eco-terrorist and his overriding passion for justice. I was not disappointed. The story is a whirlwind read with sympathetic characters, while questioning what can happen when the rage against animal abuse takes an awful toll on the perpetrators of violence and even on the animals themselves. The ending is a killer … hard to read, but harder to put down. A really fine, fine book!